ScholarVets is a revolutionary, patent-pending virtual platform for networking Military and Veteran connected college students, faculty, staff, and alumni together. ScholarVets creates an exclusive, private network for each college’s Military and Veteran ecosystem. There are currently 150 available colleges within the ScholarVets platform. The platform consists of a web portal and mobile apps for both Apple iTunes and the Google Play marketplace. 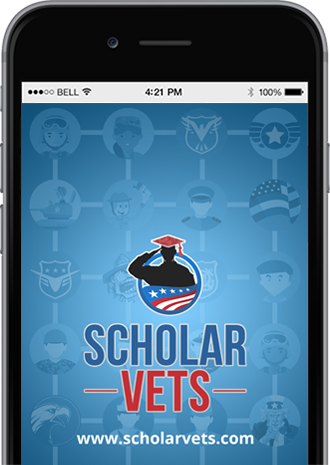 ScholarVets is free for anyone with a .edu email address to use. School administrators have the option to upgrade their school’s basic services to full academic partnership status for an affordable yearly license fee. Academic partner schools then can communicate with their members, track data, and customize the identity of their private network to match their school’s colors, logos, and imagery. More Positive Academic Outcomes – ScholarVets instantly networks every Military veteran, active duty, spouse or dependent, and ROTC cadets together based on their shared academic degree or major. Imagine being able to visually see and easily find all other veterans that are studying the same content as you are, all from your mobile phone. These easily accessible “virtual academic cohorts” increase graduation rates, student and faculty retention rates, and ultimately make better employees for companies and more successful alumni for your school. ScholarVets is focused on supporting academic outcomes and decreasing drop out rates! Recruiting Differentiator and Benefit – Military and Veteran students have thousands of choices when deciding where to use their education benefits for higher education and training. Your school can use ScholarVets as a core differentiator to communicate to prospective students that they can immediately join others like them within a trusted, private virtual community. This simulates the same camaraderie they felt while in the Military environment and directly decreases the feeling of isolation and not fitting in with the typical college crowd. With ScholarVets, you can demonstrate to prospects that they can quickly and easily find other students, faculty, staff, and alumni that are from the same Military branch as they are and that have the same the MOS (Military Occupational Specialty) code as they do. Stand out from the crowd with ScholarVets and attract the best MilVet students in America! Empower Your School Administrators – Admins of the platform have full control to manage and track user data within their school’s network. Admins can create academic departments and then assign sub-admins to manage just their assigned department. Each admin can post announcements or events, send messages to individual users or multiple users, view reports and data, and customize the look and feel with unique logos, colors, and imagery. 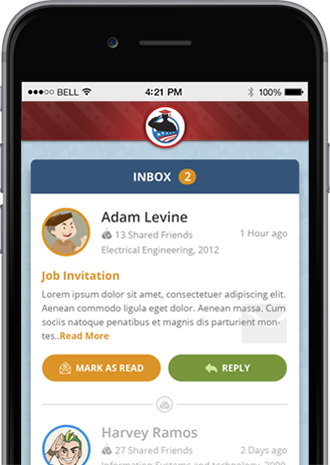 Your many admins can reach their MilVet members on the go on their mobile phones like never before possible! Leverage Mobile Phone Push Notifications – A majority of students are overwhelmed by email and simply do not check their email accounts on a regular basis. School administrators need a more effective communication channel to alert students of important deadlines, scholarships, events, and opportunities quickly. 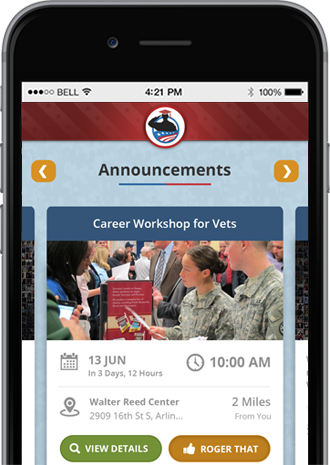 ScholarVets enables administrators to send mobile phone push notifications similar to other social media platforms, which are proven to be highly engaging and interactive. 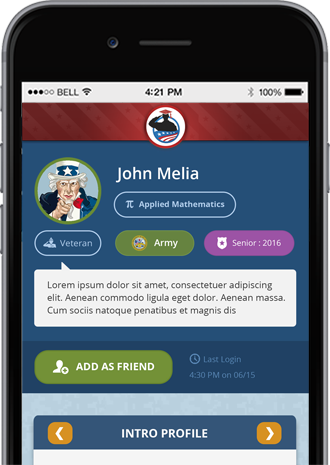 Give your Military and Veteran student administrators a modern tool to reach students anytime, anywhere and drive higher engagement rates today! 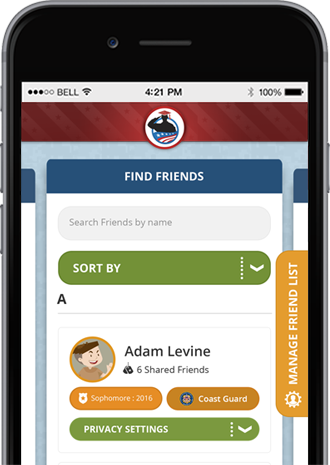 Control Alumni and Recruiter Access to Veterans – Since alumni and recruiters do not have a .edu email account at your school, each alumni and recruiter must be specially invited and approved by school admins to gain access to your school’s MilVet network. These external users then can be found by students, faculty, and staff and can also post jobs and messages to members within specifically aligned academic degree programs. Increased alumni and recruiter interaction directly increases mentoring, job opportunities, motivation, and donations. All activity of these users can be tracked, reported on, and managed in a controlled manner over time. This is only possible by using the ScholarVets platform!